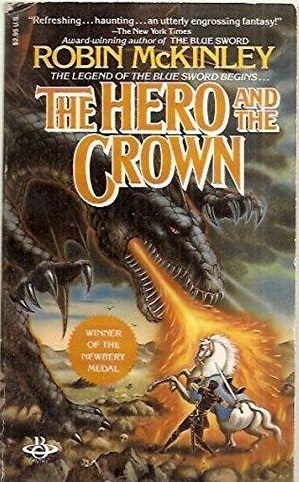 In September we read the story of Aerin, of the land of Damar, in the book The Hero and the Crown by Robin McKinley. Beneath the word 'Crown' is the huge black dragon head breathing fire on the white horse and person with the sword. Words to the left of the person and horse - Winner of the Newberry Medal"
As usual, we offer a guideline for reading The Hero and the Crown -- but remember, it's only a guideline! Read (and enjoy) at your own pace and post when you have finished a certain section. Have you read The Blue Sword (the first book of the story of Damar)? If you have, you are in for a treat as you find out about the history of this wonderful land. If you haven't, and you end up loving this book, be glad that there is another book about Damar to read and enjoy.